A space for impressions of war and its myriad costs. As a painter, I have depicted abused resources, misplaced priorities, and histories we forget only to repeat. Paintings allow dismantling hierarchies, inventing new cartographies, and exposing structures that generate the very conditions they were meant to prevent. After my son was born during the first Gulf War, the intellectual pacifism behind my work got emotional. Pietàs were the only possibility. With Operations Iraqi Freedom and Enduring Freedom, I struggled with resignation and cynicism, wondering how art can really matter. Responding to the ongoing disasters of war and the policies and conditions that lead to them, artists can condone or condemn. The challenge lies in finding a constructive stance. In the midst of the 2006 Israel-Hezbollah War and years into our invasions of Iraq and Afghanistan, I tried to find a way to mourn the carnage and reveal the loss while offering a metaphoric restitution. The results were two series: R&R(…&R), that counters art historical and contemporary media representations of war with restorative interventions, and Horsepower Hubris, that questions violence and the valor that we all too frequently assign to it. I wanted to convert military expressions like “rest and recuperation” to words like “regret and restitution.” I wanted to convey the misery of the monumental getting caught up in its own machinery. 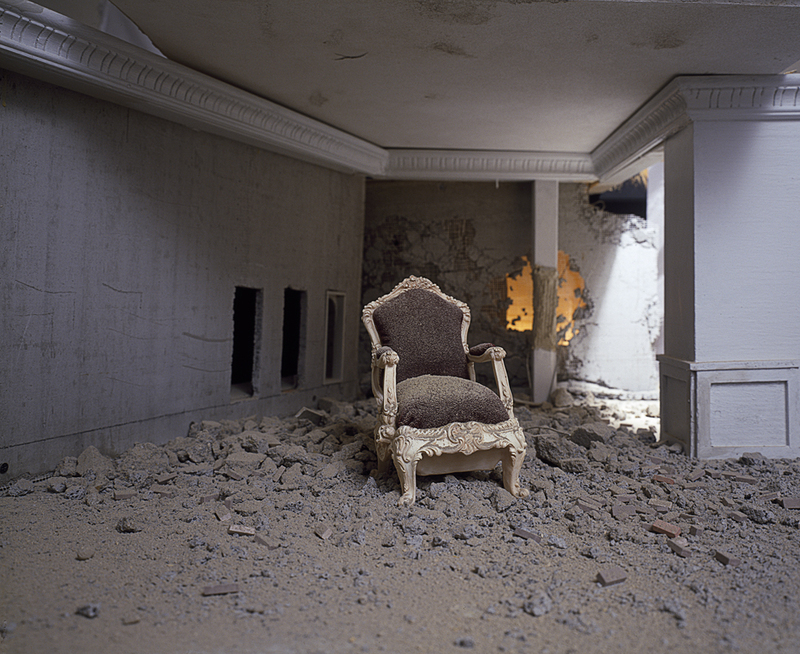 Susanne Slavick's Regenerate presents a bird nesting in rubble, the persistence of life despite the economic and military machines that perpetuate war. Motifs from the art and architecture of cultures under invasion are superimposed on images of wartime devastation. Confronting and considering the cultural heritage of peoples and places under attack remind us of what we stand to lose — the humanity of those we revere or the humanity of those we are urged to revile. Ignoring this would leave us with no culture at all. Aware of the masters like Goya and Kollwitz whose portrayals of war haunt to this day, I began to seek out contemporary international artists who react to the wake of war—its realities and its representations. I collected some of their invariably somber responses in a book project, OUT OF RUBBLE. Unfortunately, witnessing and sifting the remains of traumas we inflict on ourselves and each other through state-sponsored or individual acts of violence never seems to end. Reflecting on war from a country with a long history of conflict, the Polish poet Wisława Szymborska wrote: “Reality demands that we mention this: Life goes on.” Artists face this demand through gestures both tentative (given the scope of loss) and blatant (given the severity of impact). They mourn the havoc we wreak and atone the atrocities we commit. They create narratives bound up in the crises of truth and expose lies that lead us to folly. Before and long after the rubble is cleared, they review, anticipate and sometimes lay ground for what needs to be rebuilt. Laying this ground is a project beyond the scope of one book or even one hundred artists. It requires seeds from all sources and constant cultivation. Ten Years + Counting (10YAC) collects tools, ideas and projects just sprouting and in full bloom. The yield promises to be high. 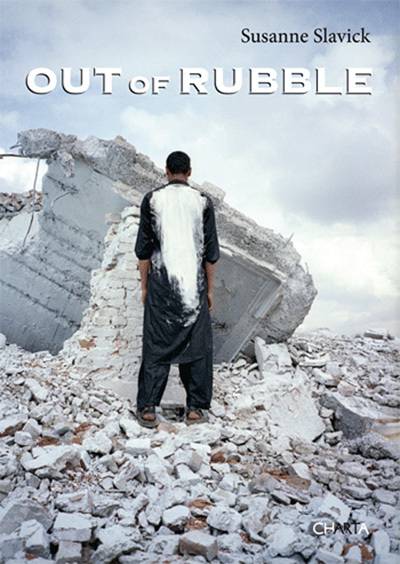 Parts of this article were adapted from the introduction to OUT OF RUBBLE, published in 2011 by Charta Art Books, Milan, available now in Europe and at the end of October in the USA . 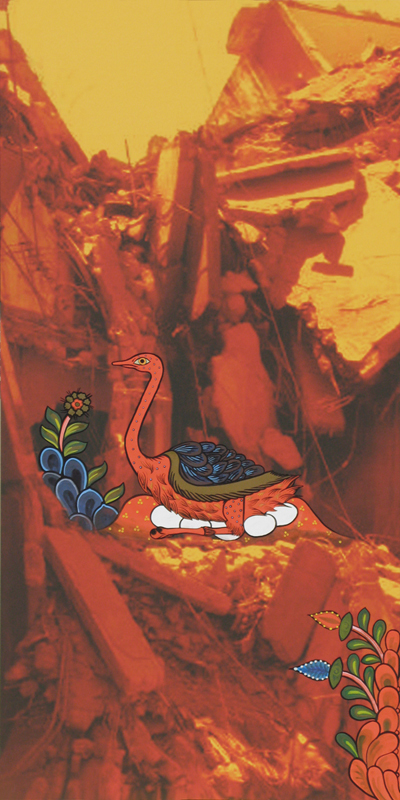 OUT OF RUBBLE artists featured in the 10YAC gallery include: Wafaa Bilal, Enrique Castrejon, Monica Haller, Andrew Ellis Johnson, Curtis Mann, Samina Mansuri, Simon Norfolk, Elin O’Hara slavick, Susanne Slavick, and Elaine Spatz-Rabinowitz. To see their work and more visit the 10 Years + Counting gallery. 1. Susan Sontag, Regarding the Pain of Others, (New York: Farrar, Straus and Giroux, 2003), 101-102. This entry was posted in Uncategorized and tagged 10 Years + Counting, OUT OF RUBBLE, Susanne Slavick. Bookmark the permalink.